Tennessee Gov. 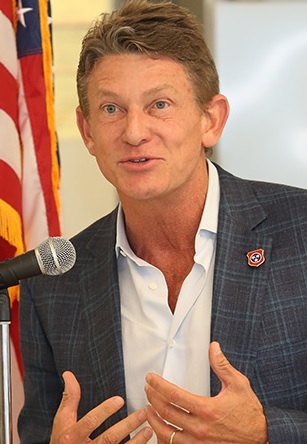 Bill Haslam today announced Department of Economic and Community Development (ECD) Commissioner Randy Boyd will return to the private sector February 1, serving as chairman of Radio Systems Corp., the business he started in 1991. Both Haslam and Boyd hail from Knoxville. Neither Gov. Haslam nor ECD announced who will succeed Boyd. Logical candidates could include, among others, ECD COO Ted Townsend, who recently chaired a recent meeting of the board of ECD's public-private partnership, Launch Tennessee (TTDC), during Boyd's absence. Today's announcement could inject fresh energy into pundits' periodic speculation that Boyd will be among GOP candidates bent on succeeding Haslam as governor, in the 2018 contest. The Haslam Administration recalled in a press release this afternoon that during Boyd's two-year tenure as commissioner, the state has been recognized as "first in the nation for advanced industry job growth, first in foreign direct investment, and second in the growth of household median incomes." The Administration also asserted that during Boyd's service, ECD generated nearly 50,000 new job commitments and nearly $11 billion in capital investment in the state, the Administration said. Nonetheless, in keeping with the vagaries of sales cycles, it recently fell to Boyd to report during ECD's recent budget hearing for FY2017-18 funding that the pace of Tennessee jobs created with support of industry recruitment and other incentives managed by ECD was likely to slump for 2016 from the level of the past two years, as reported earlier by VNC, albeit with a very large backlog of potential jobs in the ECD pipeline. No final job figures for CY 2016 have been announced. Boyd joined the administration in 2013 as a special advisor to the governor for higher education, helping create the state's Drive to 55 initiative, the Tennessee Promise and Reconnect programs and other initiatives to increase the number of Tennesseans with a postsecondary degree or certificate to 55 percent by 2025. "The State of Tennessee has gained so much from Randy's service. To put it simply: without Randy, there is no Tennessee Promise or Drive to 55 or a comprehensive approach to job growth via workforce development," Haslam said. "I will miss his energy, passion and deep commitment to bringing economic growth and success to every corner of the state, and I am grateful for everything he has done for Tennessee." As commissioner, Boyd established ECD's first Division of Rural Development and co-chaired the Governor's Rural Task Force to accelerate rural development and job creation in all counties of the state. He served as chairman of the Governor's Workforce Sub-Cabinet, Aviation Task Force, and Launch Tennessee, the state's public-private partnership to support Tennessee entrepreneurs and small businesses grow the jobs of the future. "I am thankful for the opportunity to serve the governor and the people of Tennessee," Boyd said. "The governor has taught me what a positive impact one can have in public service. The people of Tennessee and ECD's staff and many partners have inspired me with their passion and determination. It has been an honor to serve and one I'll always cherish. Now, I look forward to returning home to Knoxville to continue to find ways to best serve our state."